We designed the CB31 for Metral connectors (manufactured by FCI) which have 4x24 and 5x6 pin layouts on a 2mm grid. 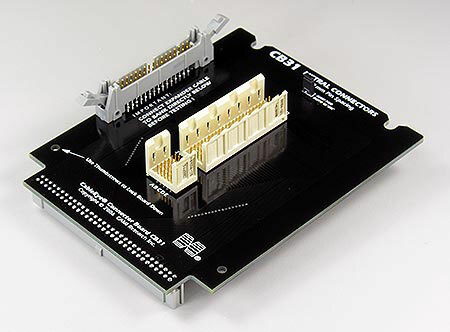 This board comes without connectors installed. Users should provide and may easily solder in connectors of the needed size. 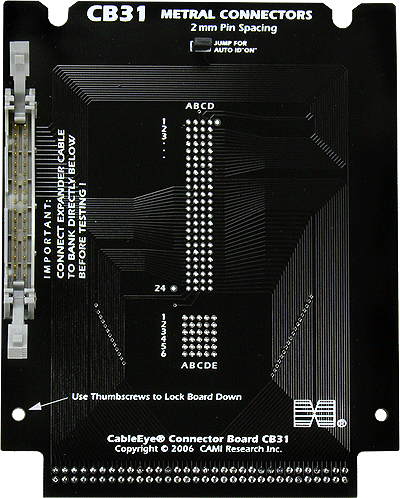 When using 4x24 (96-pin) and 5x6 (30-pin) connectors with the Auto-ID jumper in place (see Photo 2 below), the CableEye software automatically assigns the pin numbers as defined by the manufacturer for connectors of these sizes. For smaller connectors, use the optional PinMap software (Item 708) to select an appropriate graphic and assign pin labels. CAMI Research will solder in connectors provided by the customer if desired, in which case a set of test cables should also be supplied so that we may test the interface before returning it to the customer. Set of two boards with expander cables. Requires 256 test points. 1 - CB31 is shipped without connectors installed as shown here. 2 - The board appears as shown here with 4x24 and 5x6 connectors installed.